It's a good thing my middle school math teacher perhaps fibbed a little when she stated that I'd not always have a calculator with me, because I just whipped out my smart phone and figured that a pound of Trader Joe's 2015 Limited Edition Aged Sumatra Coffee costs barely over $9. A couple good cups of coffee at that price is a good deal, let alone a whole pound. And how that computes when you pay $7.99 for a 14 ounce cannister...well, my currently undercaffeinated brain was not ready to do that by itself. Speaking of being low on caffeine...so's this coffee. Typical for darker roasts, I know, but it seemed especially true with each cup. Not that it's necessarily a bad thing, but if you're counting on a cup to have the fog lifted, you might be left a little disappointed. I personally wondered if my coffee was broken once or twice. At least this is some darn good coffee. It's certainly the most coffee-tasting coffee I can recall having. Very earthy, dark and roasty, no hints of acid, no frills or kooky flavorings or anything. Just straight-up serious java. Some might say it tastes "flat" for that, but I still feel there's a certain vibrancy to it. 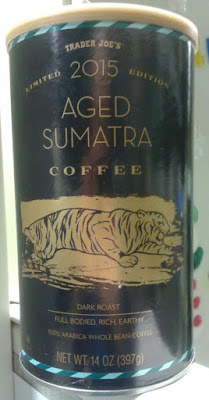 There's a whole fancy write-up on how fancy this is, with the natural process and aging and all for these "select" beans...eh, it had me at "limited edition", the price point, and the cool looking tiger. Not a wake up and slap-yo-face brew, but perhaps ideal for some afternoon-sippin' or a dinner/dessert cup. I'll let it pass with decent enough marks...which is what that math teacher did for me, for some reason. That's the general rule as I understand it - some exceptions, of course. This particular brew seemed to be fairly low octane even by the usual dark standards. Yep, darker roasts tend to have less caffeine. The deeper/richer taste doesn't indicate buzz level! Kinda like Guinness Stout being pretty low in calories compared to other beers.